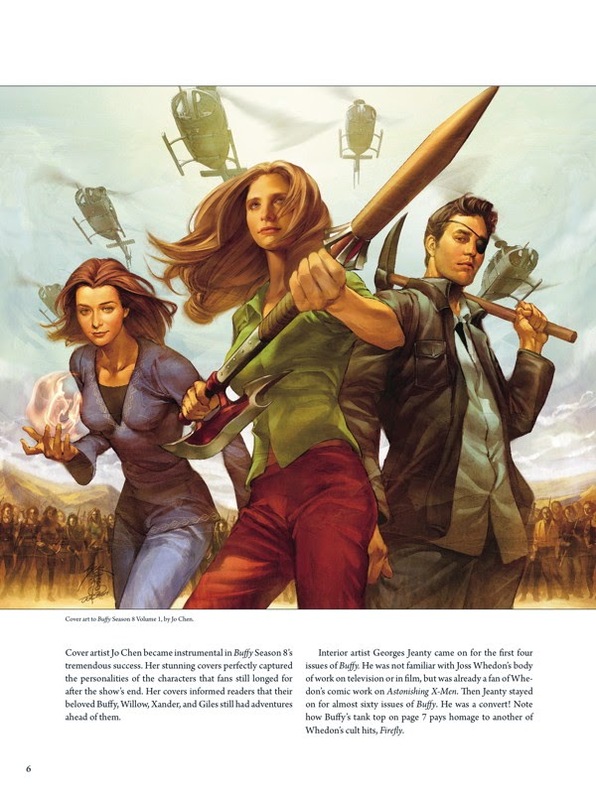 Joss Whedon’s Buffy the Vampire Slayer continues—only in comics! With guidance from Whedon, Buffy Seasons 8 and 9 and the series Angel & Faith further developed fan-favorite television characters and established new ones. This collection of cover art, sketches, and favorite sequences features art from series artists and many, many more! 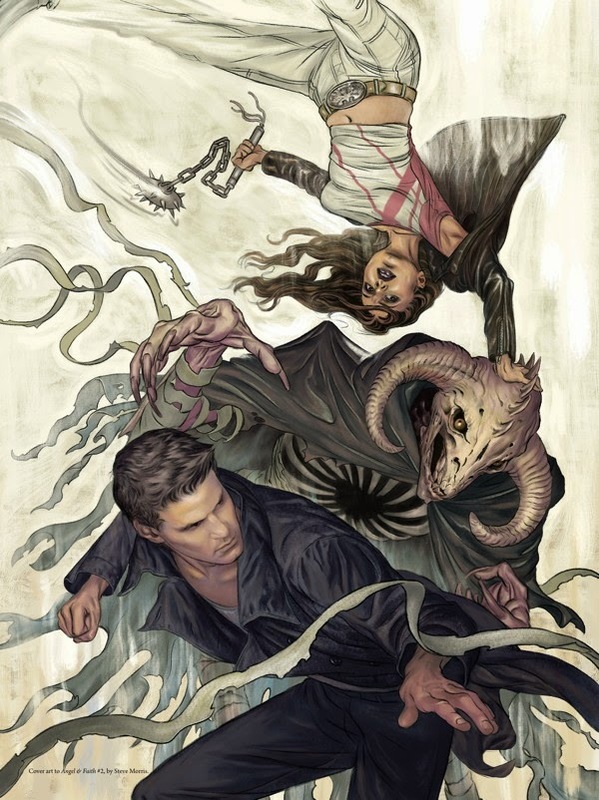 * Showcasing the most stunning art in the Buffy canon to date! * A great package for any fan of the television show! 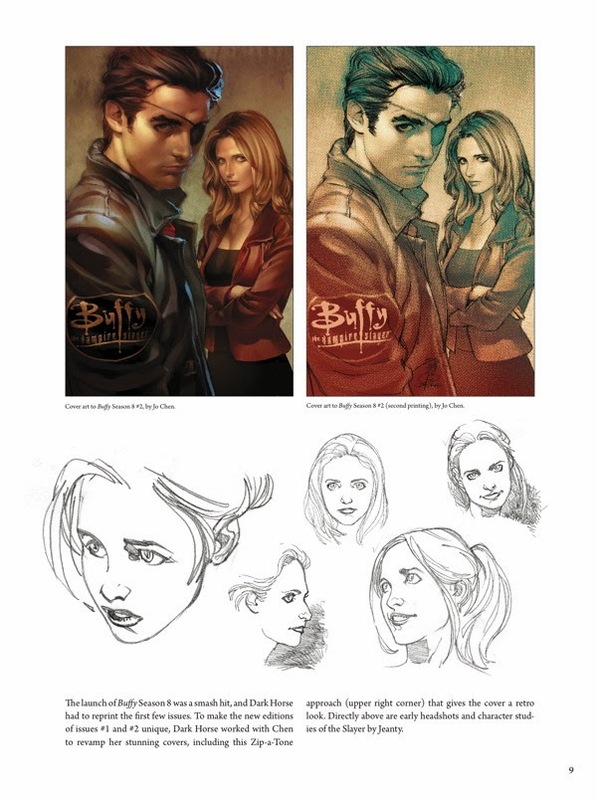 The Buffy the Vampire Slayer panel to panel issue for seasons 8 and 9 explores some of the best cover art, sketches and favorite sequences from the series’ artists and should appeal to diehard fans of the comics. 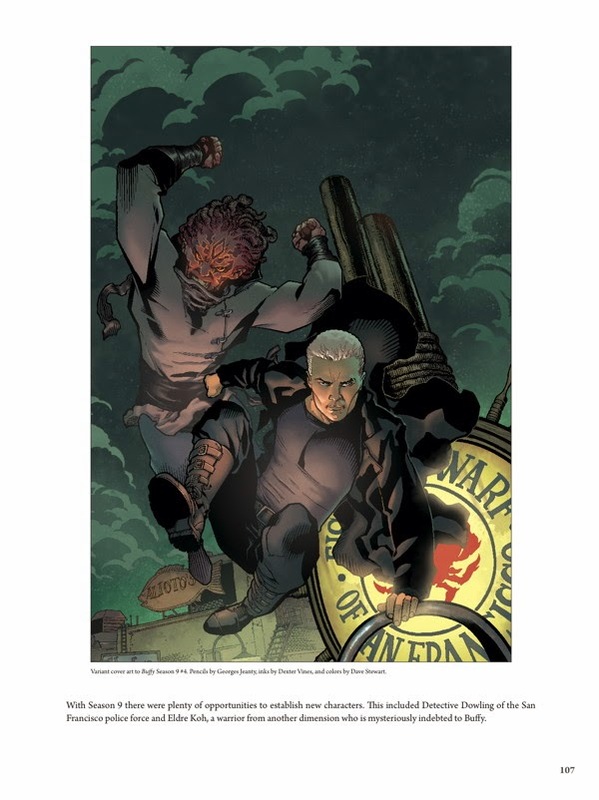 Since I’m brand spanking new to comics in general, I loved looking back at the spectacular artwork and reading about the storylines that have taken place since the beloved TV series ended back in 2003. 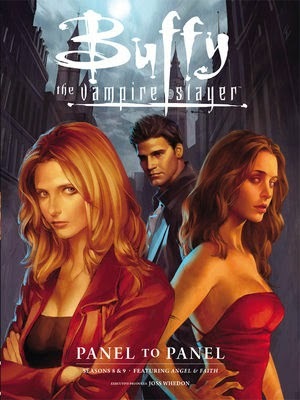 I was a huge fan of Buffy the Vampire Slayer but never had the opportunity to pick up the series in its comic form. For me, this panel to panel issue served as a “sample” of what to expect as well as a little insight into what has happened to Buffy and her friends. Apparently, a lot has happened. If you’re like me, and are just getting into the comics, all this particular issue is going to do is make you more curious than a cat in a box shop. The ultimate tease for someone like me, it whets the appetite for more. Looking at the issue I became familiar with the seasons’ artists and their work. Arguably out of all the illustrators that season 8 and 9 had, some of the best work to me was done by Jo Chen, Jenny Frison or Steve Morris. I think it’s due to the remarkable likeness to the actors from the TV show. This greatly helps someone like me who hasn’t caught up with these comics. With so many new additions to the cast, if the regular characters don’t look familiar enough to me, I just know I’m going to get confused. Plus, they’re just amazing illustrations to look at. With their artwork the characters I loved so much seemed more alive to me. 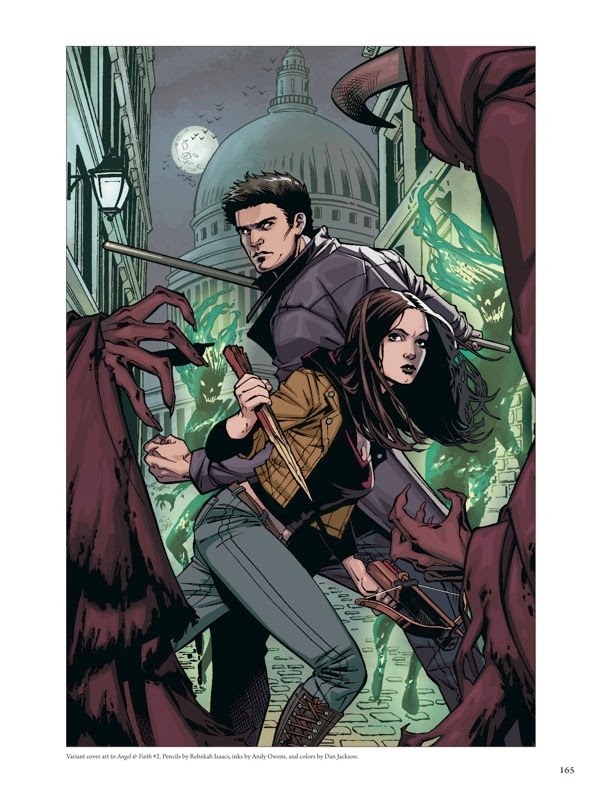 Given that this Panel to Panel of seasons 8 and 9 is the first experience I’ve had with the Buffy comics, I’ll have to reserve judgment on things like storylines and character continuity. The stories that were spotlighted in this issue certainly sounded interesting. At $24.99, it is a steep price to pay if you’re already committed to purchasing the actual comic issues. However, if you’re not interested in purchasing each issue (which I would totally do if I could swing it financially), then by all means add this one to your “Buy List” and that’s that. But for the diehard fan, I say buy it AND continue with each individual issue. After all, you never can have too much of a good thing right? I don't read many comics but I loved Buffy when it was on tv so that might change my mind to get one. This is my first foray into the world of comics so I'm still learning Mary. I've read Angel and Faith which I'm really getting into. I have to see about reading previous issues so I can get caught up with the current storyline. As a fan of both the TV series and the graphic novels, I have to say the artwork is really on par with any other graphic novel out now. I grew up on comics and graphic novels and this beats most of them for intriguing story lines and believable characters. I think the only graphic novel being put out right now that beats it is Neil Gaiman's "Sandman"